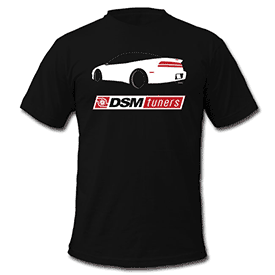 You have a factory turbocharged DSM so, of course, you want to go fast. Before you do there are several maintenance checks you will want to run through. These cars have an unfair reputation of being unreliable in other circles - much of that reputation is due to new owners throwing on a boost controller and turning up the boost without doing any maintenance. That 4G63 of yours has got to crawl before it can walk and walk before it can run. Doing the checks below will help ensure that your DSM is mechanically sound and ready for modifications. Check the integrity of your timing belt and associated components, especially if it has seen over 60,000 miles. The 4G63 is an interference engine, meaning the pistons can strike and destroy the valves in the cylinder head. This only occurs if the timing belt slips or breaks and the engine jumps out of proper mechanical timing. Refer to the appropriate article in this link for instructions on how to replace the timing belt and other components. If the age of the timing belt and associated components is unknown, or you would just like peace of mind in knowing that they are all fresh, replace the following necessary components. Please only use OEM components for the following items as aftermarket items have been prone to failure (especially water pumps). You will also want to replace items associated with the balance shaft, or just eliminate them all-together. Again, please only use OEM components, as aftermarket BSE kits (e.g. a kit from eBay) have been prone to failure. See this parts review on the eBay kit for more information. When doing a timing belt job, having the correct tools makes it a lot easier. It is highly recommended that you pick up the timing belt tool set from Jay Racing or this cam gear alignment tool from AMS and spanner wrench from Schley if you want something a little bit fancier. Lastly, youll want to verify the condition of your crank pulley/harmonic damper. If it looks like it might have started to separate, or the center section has started to spin inside the outer section, it is time to replace with either another OEM unit or an aftermarket harmonic damper unit such as a Fluidampr or ATI. Any gaskets or seals that are leaking oil or coolant all over your driveway or the undercarriage of the vehicle should be replaced. A common one is the valve cover gasket. This will help diagnose issues later with smoking and identifying other problems. Pull your ECU from the center console (located behind the stereo) and verify that there is not a birds nest of wires from the previous owner. Remove the outer case from the ECU and do a quick once over of the circuit board. If you notice a weird fishy smell or any kind of corrosion, your ECU needs some attention. This is also a good time to check what type of ECU you have. EPROM units have been found in all years and all models of 1G DSMs, but very infrequently overall. It really is a hit or miss finding one in your vehicle. Be aware that, unlike the 2Gs, an EPROM ECU in a 1G does not automatically mean the ECU is for a turbo vehicle. In 2G DSMs, EPROMs were only found in some 1995 models from the factory. Here is how to check if you have an EPROM ECU, which will allow you to run certain tuning or logging programs. A metal-cased non-EPROM ECU is the most common unit used in 1G vehicles and the only unit used in 1996-1997 models. This is likely the type you will find in your car and is functionally the same as an EPROM unit from the factory (for interchangeable models). However, if you desire to run tuning or logging programs that require an EPROM, there is a company called ECMTuning, Inc., who can convert your non-EPROM ECU to an EPROM ECU. All 1998-1999 models came with an H8 ECU. These plastic-cased ECUs are very similar to the EVO 5-9 ECUs in that they can be flashed many times to change the tune. To flash program these H8 processor ECUs, you will need to use the newer Openport 2.0 Flash Cable. More details on that can be found here. Check the fluid level of your coolant system by popping off the radiator cap (when the car is cold, of course) and make sure there is antifreeze filling the thermostat housing. You will also want to check your coolant overflow bottle and verify there is an adequate amount of coolant in it. If you have a factory overflow bottle, there are LOW and FULL lines; since the car is cold, the level should be at the FULL line. If the water pump has over 120,000 miles on it, plan to replace it as well though these are generally replaced along with the timing belts. It is important to note that brown or rusty looking coolant IS NOT a sign of a healthy coolant system. If you find yours looks like this, you want to flush the entire coolant system and get every last bit of corrosion out of it. Refill it with a 50/50 mix of antifreeze and distilled water. This is what could happen to your water pump if you decide to use regular tap water. Note the mineral deposits around the walls. This water pump was used fairly regularly for about a year. The radiator inlet where the upper radiator hose attaches is plastic and tends to crack from all the heat from your turbo and exhaust manifold. Check yours for small cracks or any discoloring, and replace the radiator if any are found. The coolant system is very important for the health of any turbocharged engine. The 4G63 uses an iron block casting with an aluminum head casting, making the cooling system ever more important due to the metals differing thermal expansion rates. Repairs for an overheated engine will depend on the severity of the overheating and will range from simple head gasket replacements to full engine rebuilds in worst case scenarios. Replace your spark plugs with copper core NGK BPR6ES and ensure that they are gapped to 0.028 to 0.030. Visually inspect your spark plug wires for cuts or loose connections and if they have over 30,000 miles on them, use a multimeter to test their resistance. Perform a boost leak test and tighten bolts/replace any damaged gaskets or seals that are found leaking. After replacement, do another boost leak test to ensure the leak is fixed. A boost leak test should be done using the same or more pressure that you plan on running with your turbo. For example, if you plan on running 15 psi on your turbo, you will want to boost leak test at a minimum of 15 psi and, ideally, 20-25 psi. Check the turbo for shaft play; replace it or rebuild it if necessary. To monitor the health of your turbo it is good practice to remove the intake pipe every 3000-5000 miles (whenever you are changing the oil), grab the compressor lock nut with a pair of needle-nose pliers and attempt to move the nut both in and out as well as up and down. Any noticeable in/out play means the turbo should be serviced or replaced soon. A certain amount of up and down play is allowed as an oil tolerance so long as the wheels do not rub the housings. Do a compression test and write down the results so you know exactly what they were. You will find the appropriate acceptable and service limit compression numbers in that tech article. The difference between each cylinder must not exceed 14 psi. If you find your compression numbers are lower than the service limit, it is possible you have a blown head gasket, worn piston rings, or a bent or damaged valve. A leak-down test will tell you where your compression is escaping to. Replace your transmission fluid. If you have an AWD DSM, you will also want to replace the transfer case and rear differential gear oil as well. The last thing you want is a locked rear end or transfer case. This is also a great time to check for worn out supports or bushings in your driveline, as well as the seals associated with the transfer case. Change your oil and oil filter. It is imperative to perform regular oil changes and routine checks. Failing to keep your oil situation in check can lead to premature engine wear and, ultimately, engine failure. How often and what types or brands of oil to use is most often a matter of personal preference. Here is a good guide to choosing the right oil and oil weight. The fuel filter is one of the most overlooked items when it comes to maintenance. If there is no record of the filter being changed, do it. When the filter is well used, it can cause low fuel pressure at the rail and injector. The factory maintenance schedule suggests to change the fuel filter every 60k miles. It is a relatively low-cost item and not too difficult to change. Do try to utilize a flare nut spanner wrench for the fuel main line under the filter. Check your brake fluid and clutch (if applicable) fluid. These should be fresh and clean. If the fluid looks dirty, cloudy, or if you don't know when it was changed last, it should be replaced. The easiest way is to remove as much fluid from the master cylinder reservoirs as possible, clean the cylinder, refill it most of the way with fresh brake fluid (can be used for both applications), and bleed the system, including the master cylinder - follow the procedure in the Service Manual. Speed bleeders, bleeder screws with built-in check valves, are helpful during the bleeding process by eliminating the need for a second helper or a brake bleed kit. Test and replace the PCV valve if you find it to be faulty (very common issue). You can install a Kynar check valve between the intake manifold and PCV valve to serve as a backup when your PCV valve fails. If you have the means/desire to check crank case pressure, it is highly recommended that you do so, as it is believed to lead to turbo death by restricting oil drainage. More info about how to go about testing this, as well as info on the rest of your PCV system can be found here. It is highly recommended you read through the whole article, especially if you are interested in installing an oil catch can. The ball joint for the 2G front lateral arm has been noted in a recall from Mitsubishi. Please call your local dealer and provide them with your VIN number to see if the recall has been performed. Any ball joint should be inspected regularly and replaced once it starts to feel a bit loose. You can identify a ball joint going bad by grabbing the stud and pulling/pushing on the ball joint. If you feel any excessive play, it is starting to go bad. If these are not monitored/replaced in a timely manner, they can cause excessive damage, and possibly injury/death if they fail while you are driving. As with prior maintenance items, its highly recommended to use OEM components when replacing worn ball joints (or full arms in the case of 2g owners). Using aftermarket parts has resulted in mixed reviews, so please do your research before going this route. Tires are obvious, but here's why they're important - AWD drivetrains are sensitive when it comes to tires due to the viscous coupling in the transfer case. Mismatched tire sizes and tread patterns can cause premature wear and even failure. And being DSMers, we've all seen mismatched tires on these cars because, let's face it, DSMers are cheap and don't like shelling out money for new tires. If you can't go out and Shop for Tires at Tire Rack , at least pick up a set of used tires with a decent amount of tread life left over. You can find shops who sell used tire sets locally or online from places like Bestusedtires.com . godprayzer, GPLaserRS, Pouffysubset and 14 others like this.